It means leads come to you instead of the other way around. There are probably hundreds of companies searching for a service like yours right now. We bring them to your website and convert them into a lead. Simply put, conversion rates are higher and cost-per-lead is lower. It’s no coincidence that Online Lead Generation grew 50% for the 3rd straight year. The experts at LeadGeneration.com will learn about your business and customize a multi-channel solution. Channels may include: Search Engine Optimization, Social Media Marketing, White Paper Creation, Call Tracking, Landing Page Creation, Content Writing and Distribution, Paid Search Marketing, Email Marketing, or Custom Platform Development. What are the Best Channels for My Business? Your business is unique. The first step is an exploratory call so we can learn about your business and your needs. Based on what we learn, we will customize a program that will get you the quantity and cost-per-lead that you need. We can meet any goal and any budget whether you need a custom web platform or a paid search campaign. Give us 10 minutes of your time to see if we are the right fit for your company. LeadGeneration.com is a WebiMax company. We are recognized as an industry leader in online marketing. We’ve been building lead generation programs for small, medium, and enterprise companies since 2008. The company has over 100+ employees serving 400 + clients. We are regularly featured as experts by media outlets such as MSNBC, Fox News, USA Today. We can help your site rank higher on Google which will turn into free clicks and leads. SEO is not an immediate lead generator but the long term ROI makes is one of the best. Usually, we suggest this as part of your lead generation program as it works best in conjunction with other tactics. Utilizing Google, Bing, Facebook, LinkedIn, Twitter, and AdRoll, we can get immediate leads through a pay-per-click campaign. A pay-per-click campaign works best in conjunction with a good landing page which we can design and build for you. When done well, email can be a very efficient way to reach new prospects, and help to nurture existing ones. This makes it a valuable component of Drip Marketing campaigns and we tailor the approach based on each client. This may include identifying lists to market to, developing creative, and implementing and optimizing tools to automate the lead nurturing process. We build landing pages that CONVERT. We’ve learned the science to increasing conversion rates by designing simple, clean pages with eye-popping graphics and carefully crafted content. Let our experts help increase your ROI. 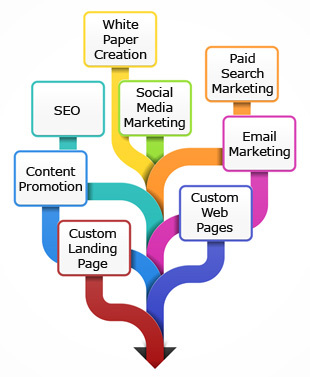 We can also build a creative lead generation solution. 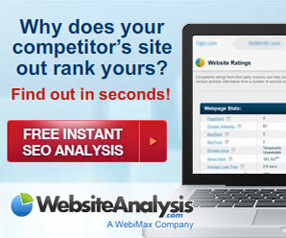 For example, we built www.websiteanalysis.com – hundreds of business owners give their contact information to every month in exchange for a custom, automated website analysis. WebiMax gets the contact information and is able to convert these leads into sales every month. A custom solution like this might cost more up front, but the outcome could be a game changer. Our experienced content writers can help you with blogs, white papers, web content, and press releases. Once the content is created, we’ll make sure to get maximum mileage from each piece through content distribution and lead conversion. We can utilize a white paper to help generate leads through a custom landing page, or maybe you want your press release in front of editors, or maybe you just want your blog to get more visitors. Contact us and we can help you decide. Every year, social media grows more and more important. Whether you need to kick start your social media or optimize your efforts, we can help. If you’re an SMB, it might be best to focus only on Facebook. If you’re B2B, maybe we’ll just focus strictly on LinkedIn. Depending on your goals and budget, we’ll advise you and come up with a plan together.